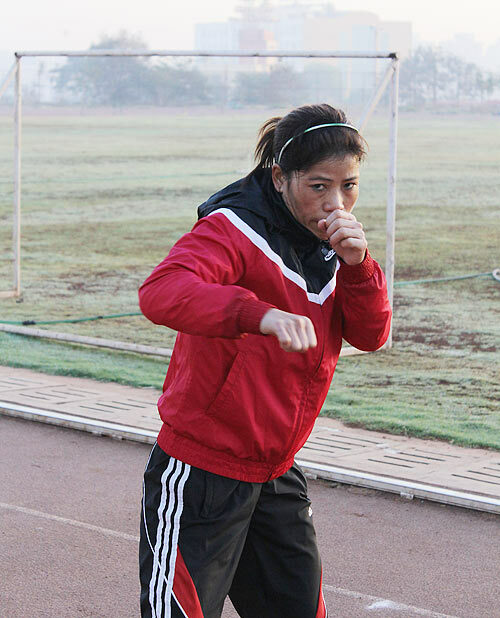 Laxmi Negi spends a day in training with India's boxing queen MC Mary Kom at the Balewadi Sports Complex in Pune. There is a slight nip in the temperature, but no one is complaining at the Balewadi Sports Complex in Pune. The cool breeze hits coach Charles Atkinson's face and brings out the best in him. But it's not just the weather he admires; it's his brightest prospect -- five-time World boxing champion MC Mary Kom, who is stretching. "Isn't she flexible?" he asks. The question needs no affirmation. 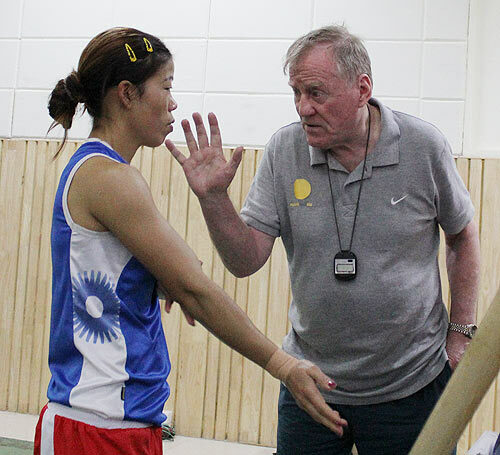 Atkinson, the revered English coach who has been hired specially to hone Mary's preparations to qualify for the London Olympics, knows it all. The primary reason for the coach's good mood is because Mary has hit her peak. 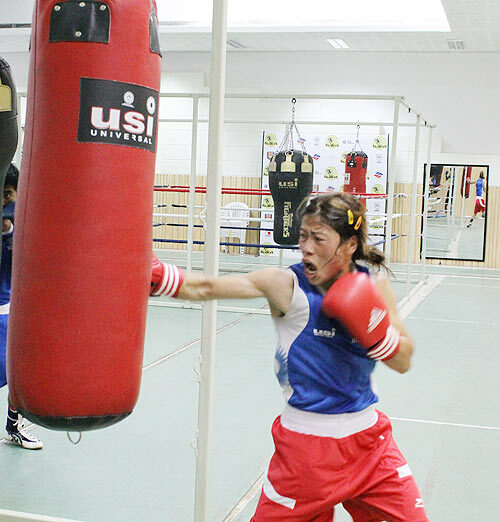 She is training for the upcoming Asian Championships in Mongolia. Then, come May, she faces her biggest test in a bid to qualify for the 2012 Olympics. Atkinson is so pleased with his workaholic boxer's progress that he asks her to go easy. "She didn't come here in a good shape, but within two weeks she has shown tremendous progress. She lives a clean life and, therefore, responds to training quickly," he informs. The compliment, though, doesn't call for a jig. Not yet! Her presence in the 51kg weight category is itself a big battle. It was a year-long struggle with friend and state-mate Satira Devi to get hold of the coveted weight. 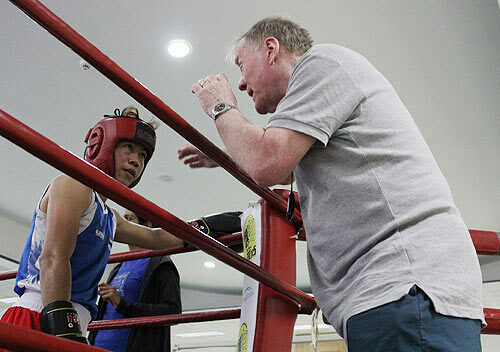 Having been a World champion at 46 and 48 kg, Mary had tested the ground in the 51 kg at the 2010 Asian Games in Guangzhou, from where she returned with a bronze medal. 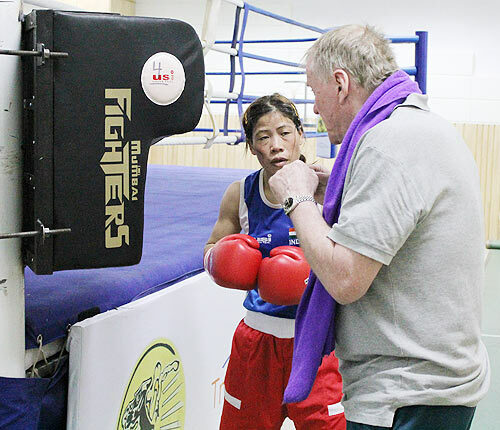 The third place got tongues wagging immediately; even her coaches felt she was not good enough to box in 51kg. 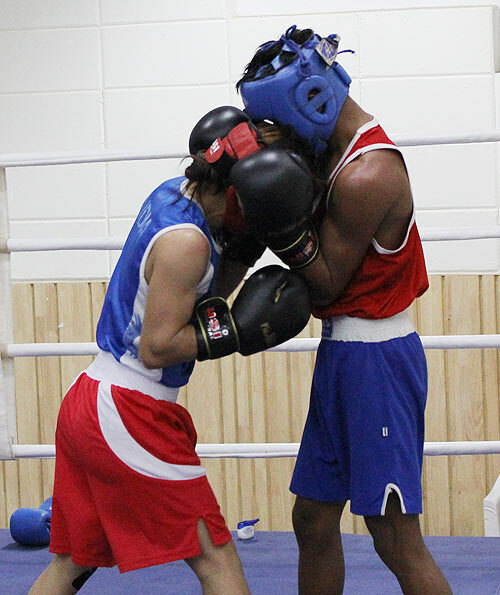 But Mary did not lose hope; she made a strong return at the 2011 Nationals and silenced her critics, defeating Pinki Jangra in the final and earning the right to compete in the 51kg. 2006 World champion Sarita, who was beaten in the semis, had to settle for the 60kg. Mary was quick to play down talk about rivalry between her and Sarita Devi. "Not just Sarita, but anyone is free to challenge me; it's a free country. 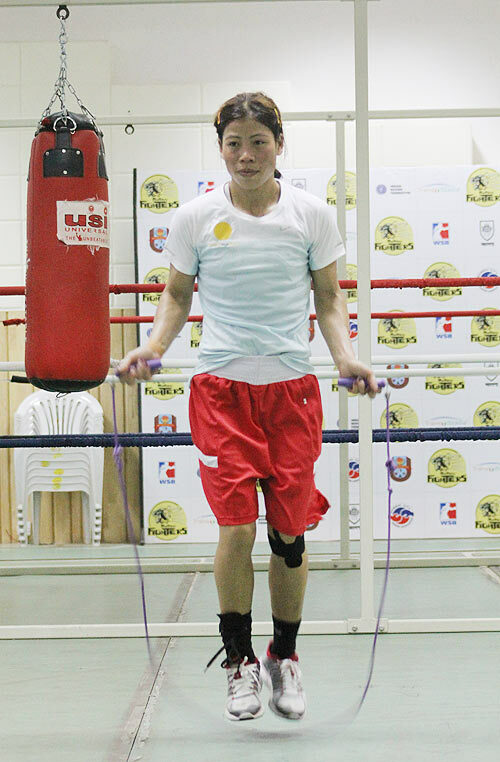 But, thankfully, I had performances to back my stake for the 51kg weight category," she declares. It is here that this writer is treated with the veteran trainer's Liverpool accent and humour. Yet again he reminds that it is the feel good factor he receives from his protege is what he appreciates. There is no word spoken in the 30 minutes' grind Mary is put through soon after, but her laugh that resounds at the end of it confirms the coach's intuition. "I don't work with strangers; I knew who she was, and this season she trusts me more," says Atkinson, about his second stint with Mary. Now, remind him about the Herculean task before them -- that tongues get wagging if they fail -- and his calming smile is back. Again, he doesn't say much, but you understand that he has things under control. After much coaxing he gives in. "Tournament is a lottery; you enter it to give yourself the best chance to win. So here we are trying our best," he says. Earlier, when Mary was unknown, it was easier for her to sneak into the country with a gold medal in tow; that was the only time she made news. Now, she is a familiar face. Though she is yet to book a berth at the London Games' women's boxing, which is making its Olympics debut, millions of her admirers are already expecting a medal from her. Dressed in a bright pink Olympic Gold Quest T-shirt, Mary shuts her eyes, as if she is imagining the entire hype. "There is tremendous pressure and the weight of expectations is unbearable sometimes, but, then, I think a successful athlete goes through this kind of pressure all the time. I channelise all my energies to my training," she says. The coach has carried the good mood to the afternoon training session and gives Mary a free hand in the ring, where she has to spar with a stronger and taller boy. Atkinson does not carry any notes and is quick to point to his head. "It's all in here," he avers, when asked how he assesses Mary's preparation. He just advices her to do whatever she wants to in the ring. But, then, the coach in him forces a few quick pointers. He asks Mary to focus on blocking the punches that are coming her way. Mary goes through her paces as if gearing for a real brawl, her gloves tightly taped and gum shield in place. "Block everything," shouts Atkinson, as he starts his stop watch. The shy, diminutive lady moves to the centre of the ring and starts throwing punches at her opponent. At the end of the round, when she reaches her corner, instead of occupying the stool, she stands, and after a sip of water looks in the coach's direction. He is prompt in analysing her style and wants her to score plenty of points in the next round. In the bargain, Mary gets a few hard knocks on the face. "You learn your lesson in between the ropes and not on the punching bag. If a boxer makes mistakes in the ring she would pay for it there; a punching bag doesn't hit you back," he says. He has got his point across. In the next round the coach wants the 28-year-old to focus on her defence. All he says is, "Never drop your guard." Mary heeds the advice and, in the bargain, makes her opponent see stars in broad day light. Happy with his boxer's performance, he says, "You are doing okay!" In the fourth and final round, Mary is reminded of the amount of experience she has, the need to bank on it while fighting and all that went into her earning the tag of 'Magnificent Mary'. Atkinson's words work wonders for the pugilist as she is able to get the better of her opponent. Remember, it's a boy she is fighting; he is much taller and heftier than the mother of two. Mary now uses less of her patent hooks and goes for more jabs. The coach assures that hooks won't be taken away from her; he is not making her look unpredictable. He is working on making Mary inflict more damage on her opponents, which, in turn, will earn her more points. Sounds simple, but only the two know how much effort goes into it. Atkinson signals the end of the bout and the gloves come out. It is hard to miss Mary's well-manicured nails, with purple nail polish. Her white nail art is also hard to miss. She turns red when the colours are pointed out to her, but soon becomes a style-conscious woman. "I am a woman after all and love the colours," she says. One later realises that when Mary is not trading punches with boxers in the ring she spends time grooming herself. So what's her take on the attire for women boxers? She is thrilled to don a skirt for international tournaments. She boxed with one at the 2010 World Championships and is looking forward to turn out in one when she fights. "Women who play tennis wear skirts, so why can't boxers?" she asks, before getting back to her day's training regimen. She goes to the punching bag that hangs from the iron beam and beats the hell out of it, even as Atkinson intervenes and wipes her face with her purple towel, telling her not to drop her guard. That routine over, Mary stands in front of a huge mirror. It's time for shadow boxing and ten minutes of skipping. As she moves, the few spectators that have gathered watch in awe. Atkinson appears satisfied with the performance. A man of few words, all he says is: "You did well." Asked why he isn't complementing Mary for the good day's work, he explains: "A Rolls Royce doesn't make any noise, but when it comes to performance, it's the best. A fiat will make a lot of noise and yet the performance wouldn't be satisfactory. Noise is not always a good thing. "You see, the mood is good. She need not tell me, I know it all." Another day in her journey to qualify for the London Olympics is over. And, with each passing day, Mary knows the grind is only getting tougher.